Hydroelectric generation contributes around 60% of New Zealand's total electricity supply, with many generators of widely varying sizes distributed throughout the country. Inflows (rainfall and snowmelt) can be stored in hydro lakes until needed. The most important are Lakes Tekapo, Pukaki, Hawea, Manapouri, Te Anau, and Taupo. The lakes have quite limited operating ranges – for technical and resource consent reasons, each lake's level cannot be lowered below a certain point. It is not possible to completely 'empty' a hydro lake! In the absence of inflows, the lakes can only hold enough water for a few weeks of winter energy demand. For security of supply purposes, hydro storage is divided into two categories; controlled and contingent storage. Generators can use controlled storage at any time, but contingent storage may only be used during defined periods of shortage or risk of shortage. During sustained dry periods, controlled and contingent storage are important indicators of overall supply risks. South Island controlled storage, representing around 85% of New Zealand's controlled storage capacity, is often used as a key measure. Storage is expressed in gigawatt-hours – GWh (a measure of the energy that can be produced using the water). Total controlled storage for New Zealand is above average for this time of the year. 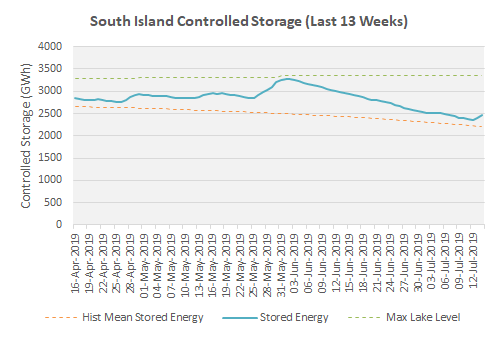 Over the last week controlled storage in the North Island decreased and the South Island has increased. As at 14 April Lake Taupo is at 149 GWh which is about 26% of it's maximum controlled storage. 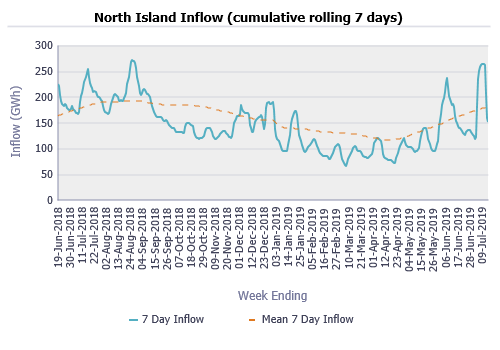 Inflows into Lake Taupo over the last week were below average for this time of year. The graph to the right shows current South Island controlled storage relative to the assessed Riskmeter levels. 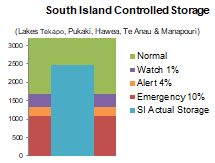 The middle blue column represents South Island controlled storage. 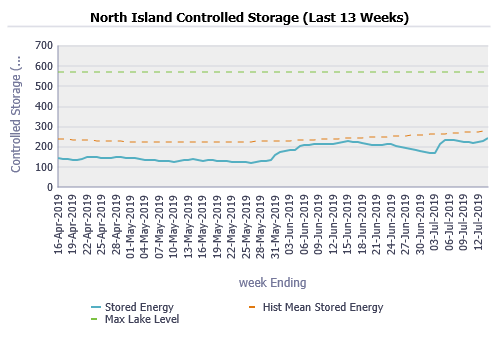 Controlled storage as at 14 April is 2873 GWh, which is about 87% of the maximum South Island controlled storage. This is above the historical average for the time of year. 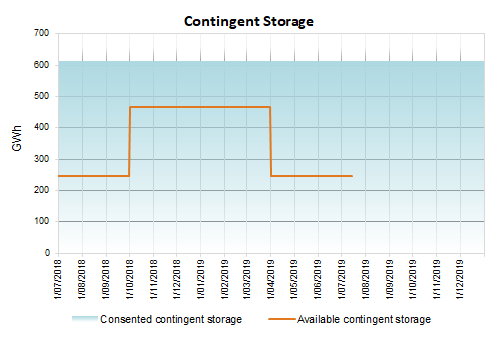 This amount of controlled storage places the column in the Security Normal range, which means that the risk of hydro shortage is assessed to be less than 1% (barring major unexpected equipment failures). 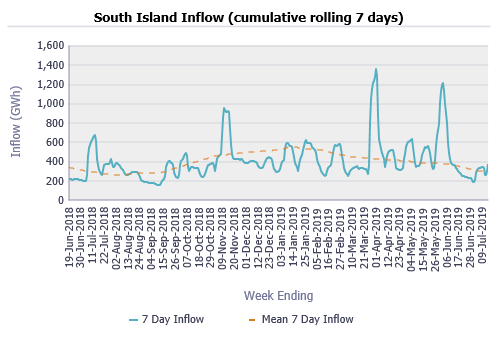 The graphs below show current South Island controlled storage levels and weekly inflows into the South Island hydro lakes. Contingent storage is stored hydro that is only made available for generation at specific times to mitigate the risk of shortage. The conditions that allow contingent storage to be used differ with each hydro lake, and are governed by resource consents between the relevant local authority and generator. For more information on contingent storage and the conditions of its use, refer to the document below. On 14 August 2018, the treatment of Lake Tekapo contingent storage in the HRCs was updated to align with the Security of Supply Forecasting and Information Policy. For more information, see the linked document below. On 8 June 2017, we received a request from Meridian Energy to consider an urgent change to our Security of Supply and Forecasting Information Policy (SoSFIP) to include contingent storage in the calculation of the hydro risk curves (HRCs). The current policy is to exclude contingent storage from the calculation of the HRCs. On 21 June 2017, Meridian advised it would no longer seek consent for Pukaki contingent storage to be accessed at a lower risk level. Consequently, any urgent change to the SoSFIP would apply only to Lake Hawea contingent storage being included in the HRC calculations (67 GWh of storage that becomes accessible at the 4% HRC). Transpower, in its role as System Operator, has determined it will not submit a variation to the Electricity Authority to change the treatment of contingent storage.